Do your younger siblings have temper tantrums? Or do you maybe remember your own fits of screaming, crying, kicking, and whining that drove your parents—and any unlucky bystanders—up the wall? No aspect of human experience seems to be unworthy of study by psychologists, and temper tantrums are no exception. A new study of these toddler tempests indicates that tantrums follow patterns and that these patterns give caregivers opportunities to calm the storm. The findings can also help parents distinguish between normal upsets and those that might indicate a serious illness. Before they could analyze the tantrums, the researchers had to collect data. To do so, they recorded the sounds of more than 100 temper tantrums by attaching wireless recording devices to toddlers’ onesies. If a child had a meltdown during the session, every ear-melting moment was recorded. The researchers then analyzed the sounds. One of the study’s findings indicates that anger, with its screams and thrashing limbs, and sadness, evidenced by whining and whimpering, occur throughout the tantrum. Child development specialists had thought that temper tantrums start with anger and devolve into sadness. There are peaks in the anger, though, and getting past the peaks to the lingering sadness offers a chance to calm the child. 1. Just wait it out. Get the child to a quieter place where she won’t disturb others. 2. Don’t try to coax the child into better behavior, threaten, bribe, or question. The child is not listening to even your most eloquent reasoning. 3. Offer comfort. Once the child is past the peaks of anger, he will want to be comforted. 4. Find the humor in the situation. Well, you can try. 5. Don’t take tantrums as a personal failure. They happen in every family. Read about the temper tantrum study on this “Moments of Motherhood” blog. 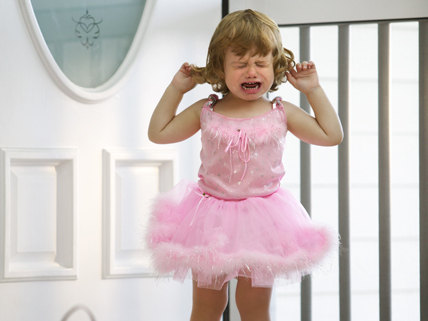 Listen to the Morning Edition story on science of temper tantrums; includes “Anatomy of a Tantrum” video. Review basic information on tantrum behaviors at this British website for parents. Read what Sigmund Freud and others have said about tantrums, and find additional links. whoa that was like me! first comment! Great post! Nya is only four months but still has a way of litnetg me know when she is unhappy by squealing, squeaking, and becoming very squirmy. Given her baby “mini tantrums” now, I am nervous about what is to come with the toddler years!-Jessica a.k.a Nya’s momP.S. I am now following! To age oolong, you need to lltghiy ‘bake’ it yearly, to reduce the humidity it absorbed.Puerh does not have this problem. Thanks to humidity it experiences post fermentation. Humidity and heat actully improve aging, but best is to let this happen naturally. So, I wouldn’t control humidity (except if too dry) or temperature (except to keep it from cold or freezing!) Only important thing to control: odors! Keep bad smells away from your tea.Climate change has an impact. Good or bad also depends on taste, I guess. You may also grow more attached to a tea aged at home than in a place you never lay foot. That looks like my sisiter. Yay second comment! i quess i will be number 8 2 post a comment…..but i dont think that the 5 not-that-easy-to-follow basic rules are so ok but it could get better. Also, the children might not just have a temper tantrums because they cant get something it as 2 deal with the parent hitting the child when they do something wrong…. I think that the 5 listed recommendations are very helpful to the ones that do not know how to control temper tantrums of young toddlers. Therefore, It can help anyone understand the main reasons why infants throw fits, holler, kick, and scream when they are angry or or sad. I also think that that was a very good way for the researchers to collect data and find out the reasons why they threw temper tantrums. Jezzzzzzzzzzz! Toddlers and Tiaras Here she comes!!!!!! !